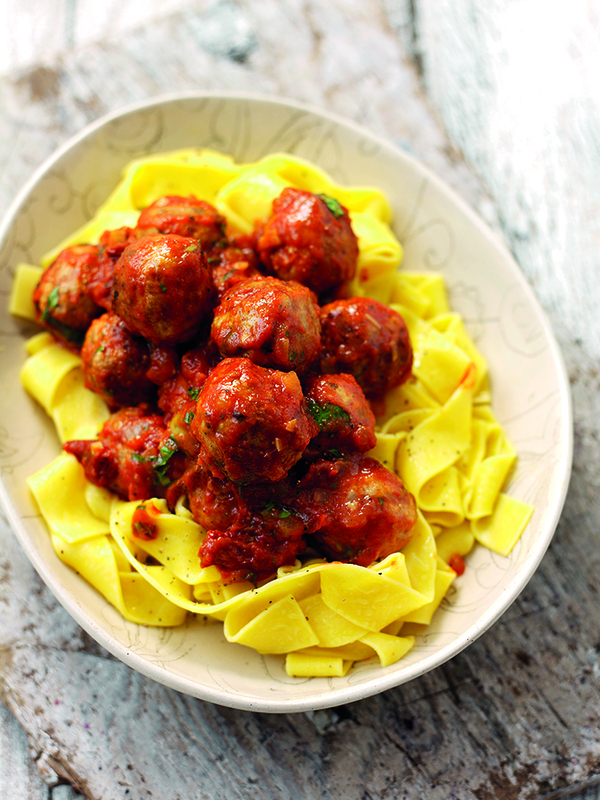 Pheasant meatballs with green olives, sun-dried tomatoes, herbs and Pappardelle pasta. Designed by Taste of Game chef Jose Souto. Take the bread, remove the crusts and place in a bowl. Pour in the milk and allow to soak and break down. Add a little oil to a saucepan followed by chopped onion and garlic. Sweat and cook without browning and until soft. Add stock and reduce by half. Now add sun-dried tomatoes and the Passatta, bring to the boil and allow to simmer for 20 minutes. Place the minced pheasant and pork in a bowl with the bread that by now will have absorbed all the milk. Mix in the meat well with your hands and season. Take a small ball of meat, flatten and pan fry to taste the seasoning is correct. Divide the meat into equal sized balls, wet your hands slightly (this will help you roll smooth balls) Allow 4 or 5 balls per portion depending on size. In a non stick pan with a little oil, pan fry the balls to give them a little colour. Once all have been pan fried, drop them into the tomato sauce and simmer for 10 minutes. Bring a pan of salted water to the boil, add the Pappardelle pasta and bring back to the boil. Cook the pasta for 8 minutes or until cooked throughout. Once the pasta is cooked, drain well, toss in some virgin olive oil and season. Place the pasta onto the plate with the meat balls on top and a good helping of sauce. Enjoy!